Thirty-one years ago I was a student in a Highschool Foods Class. My friend Becky who teaches at our local Mennonite High School recently invited me to be the "expert" at a Professional Development day teachers learning class. I jumped at the opportunity to see how Foods is now being taught in high schools. 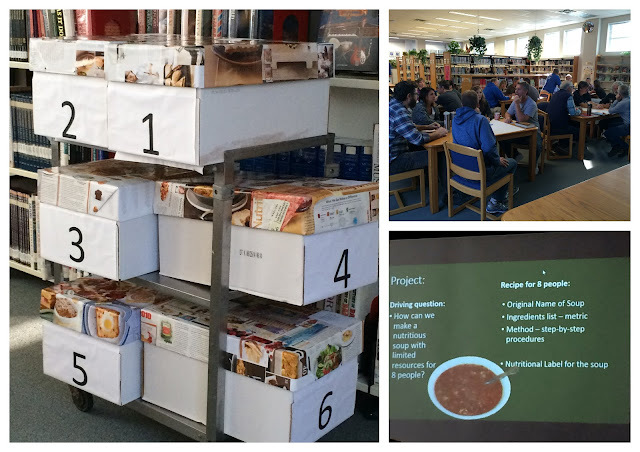 The school staff became the class of students in learning how to teach project based learning. The class I attended happened all in a few hours and moved very quickly to understand the full approach. The high school students will do similar projects over the course of several days. 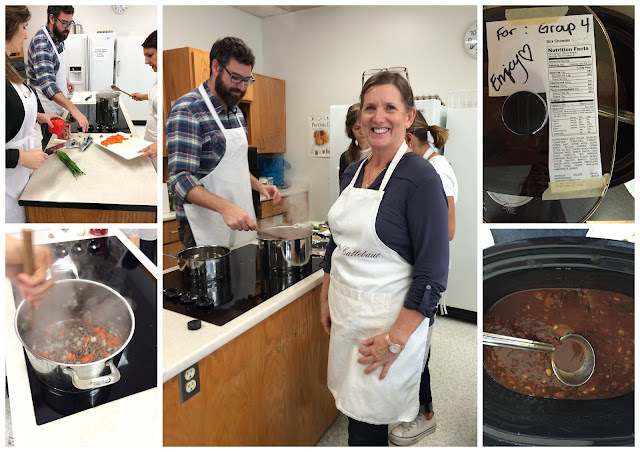 The class was divided into teams and were assigned mystery boxes holding ingredients to make a soup. Instead of teaching only how to follow a recipe, students are taught to think how the ingredients in their box are best used to make a product that is pleasing to the palate and also to the eye. It was fun to peek into their boxes and see how they worked together as a team, brainstorming on which methods should be used as they created their recipes. As they completed their recipes on chart paper, they were encouraged to move around the room to offer encouragement or observations on how certain methods of preparation might not have the desired effect. There was time given for feedback and more team thinking. After the recipes were developed, one from each team moved to the computers to work out and print the Nutritional Facts and their recipe while the rest of the team went to the Food Labs and began to prepare the soup that they would later share with each other for lunch. As they worked, there were times that the class was paused to hear about Food Safe tips and also they were asked to stop what they were doing to watch a teaching video of how to properly use a sharp knife. The teaching staff essentially practiced how to teach project based learning by participating in a project based class. I have often thought of how I was taught the love of cooking by my high school food teachers. If the energy and enthusiasm that I witnessed in the project learning class is any indication, there will be great foodies coming out of highschool equipped to provide nutritious and delicious meals in their own kitchens. I'd love to hear your experience of learning how to cook. Let's get a conversation going. To celebrate the love of teaching others to cook, I'll select one name from the comments on today's post and send one of our cookbooks out to the winner. Winner will be selected on Sunday and will be announced on Monday's recipe post. How did I learn to Cook? At my Mother's side. She was a simple cos,no fancy recipes,but the food she set before us was always very tasty.Her encouragement helped me to strive to be a good cook. Many of her recipes were not written down on paper,so when I was about to get married,I had to beg her to put them down on paper so I could use them in my own home.That's some 43 years ago and I still use some of her recipes. I gained my appreciation and love of cooking from my Grandmothers. I learned different things from each wonderful lady, but combined I was able to gain the knowledge of how to, best practice and importance of a well balance meal.. nutritionally and visually colored( too yellow/brown a meal? Hurry and find some green beans or peas!) By the time I was in middle school and was required to take a Home Ec class I was already a pro at the class basics, to the point that when I was being tested on the best way to measure Crisco/Lard, I argued with the teacher that my answer of glass measure was in fact accurate. I was taught the cold water displacement measure by Grams.. it made for a much easier clean up- no greasy cups to scrub! My nickname in HighSchool was *Betty*.. as in Betty Crocker ! My mom was never much of a cook/baker so with both my Grams passed I am taking the time to share the love of it all with my 10 year old daughter! She is already a natural, her twin brother and older brother are works in progress! My mother was a good cook who made simple meals using a variety of fruits, vegetables and meats from the farm. When I joined 4-H I began to learn other things and won many awards in Foods Classes. I also learned many skills in Home Ec classes. I strive to cook my family nutritious meals every day. I learned to cook by remembering my mother's food who sadly passed away when I was 16. She was incredibly talented, and myself and siblings learned to appreciate really good food from a young age. Through trial and error, lots of practice, I can now confidently say I think she would have been proud of what I have learned from her. She never used a recipe in her life, although I do, I will always add my own flair, or touch to a recipe that reminds me of her food. She was a true inspiration. As a young girl growing up in Canada, I sadly did not want to learn the Polish dishes that my Mother would make. I wanted to learn to make Canadian food like all my Canadian friends ate, so I did not really learn to cook until I left home and learned myself, as my Mom did not know a lot of Canadian recipes. I learned by trial and LOTS of error, until today at the age of 60 I think I can finally call myself a good cook. And now I would love to make all the Polish food that my Mom would make, but sadly at 89 years of age she cannot remember her recipes. I am very sad that I did not learn more from her when I had the opportunity. So I will say to all the young girls and boys that want to cook.....listen to your Mama"s! I have learned much from reading cookbooks and watching television chefs. It seemed that children were not welcome in our small kitchen when I was growing up. But I do love messing about in the kitchen and trying out new things. I'm an impatient cook so I don't think I'll ever be a really good one, but I love the process. My mom didn't really enjoy cooking that much, although she was pretty good at it, and didn't really welcome help in the kitchen. So I taught myself how to cook when I moved out of the house. I discovered that I loved cooking and since I was only cooking for myself, I didn't have to worry about anyone liking it but me! Since then, I have developed my skills and still love trying new recipes. 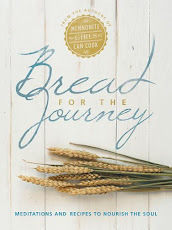 I found this blog when looking for some traditional Mennonite recipes that gave better instructions than those in my Mennonite Treasury! Sadly I was not taught to cook growing up at home. My love for cooking started when I was in high school taking home economics. Then when I moved out on my own I had a roommate who loved to cook and taught me many things. From there I have expanded out on my own taking some cooking classes, reading cooking magazines and trying various recipes from cookbooks and off the internet. My sister and I learned how to cook at an early age for the rest of our 7siblings, so it took a lot of food. We had a large garden and grew our own meat, we often didn't have a lot of time after coming home from school and usually had to come up with menu on our own too. We chafed then, but both of us have a great love of good food and cooking today and cherish our Mennonite heritage of being able to take a box or fridge with food ideas and create something both delicious and nutritious. Home Ec (or foods) isn't in the curriculum of many high schools around here anymore; and I think that's a shame. My Mama taught me how to cook and because we where a Navy family moving from coast to coast and even to an island she also taught me how much fun it was to try out the local food specials and figure out how to make them at home. Though I started at my mother's side most of my adventure into cooking was through trial and error from reading and just trying new recipes. I was turned loose in the kitchen at age 5. Mom got out any ingredient I couldn't reach, turned on the oven and I made cookies. Quickly learned that baking soda or baking powder tasted awful butwere necessary for tender cookies. My Betty Crocker Boys and Girl Cook Book was my kitchen Bible once I turned six and learned to read. Mine was a stay at home Mom. She was constantly cooking, baking, creating. Unfortunately for me, she never used recipes. Did everything by feel, taste and what was available. I think I just soaked it in after being around that method for so long. I honestly never really had an interest in cooking until I had to do it for myself ... and, somehow ... it was just there. From then on I developed a love for trying new recipes. I've got them on so many scraps of paper, old books, Pinterest. Many new favorites are from your Mennonite Girls website because they remind me of what I grew up with. Just made 45 of your Meat Stuffed Buns yesterday for the freezer. My early years were spent in the sw Mo Ozarks where my first cooking attempts were polk berries in a mud crust baked on a rock in the sun. Later I learned to make fried peach pies from a great aunt who picked, sun dried, and stewed peaches from her trees .After moving to the northwest a friend, Rocky,shared her fish soup recipe. Hispanic co workers, pozole. A dear friend, Bev, taught me her Alaskan Native husband's favorite, pirok. What I cooked was a combination of trial and error and loved recipes shared by friends I made over the years. I'm still learning at 74. I grew up the eldest of five on a small fruit farm in rural Ontario. I remember it was my job to bake a cake Saturday mornings (as well as do the dusting). My mother would make the pies and cookies for the week. I was never interested in cooking/baking and thought my cake contribution was quite enough. Being married and on my own at age 20 was quite exciting and learning to cook was trial and error. The Betty Crocker Cookbook was my go to cookbook in those early days but my mother thought I should also cook with a Mennonite slant and gifted me The Mennonite Treasury cookbook which I still have to this day. Now 49 years later I still don't venture too far away from a recipe but I can look at the ingredient list and know whether or not I will like the outcome. Since finding your website, many of your recipes have turned up on my dining table. Learned to cook from my mom at an early age. My parents both worked so my brother and I were the ones cooking dinner quite often during the week when we were teenagers. Great learning experiences!! I learned to cook by my mother. Was often in the kitchen with her baking. She was always baking - for repairmen that came to our house, to food for people that just had surgery, etc. Often had company for Sunday lunches. Often in the kitchen and the garden. Good memories come along with that too. My mother and grandmother were so patient in teaching me to cook, bake and preserve food. They let me pull a chair up to the table to stand on to"help." They let me pick my own fruits and helped me make scrap pie crust pies. I'm pretty sure they may have re-washed a few dishes that I helped with, too. I enjoyed sharing my kitchen with my own three children, and with some of their young friends, too. It seems that many mothers don't have the time or patience (or maybe they just don't cook!) to teach their kids, but my experience has been that kids really enjoy learning, and cooking is a skill that will serve them well. I loved to watch my Mom cook when I was little. One of my favourite activities was to "help" form buns. My mother would give me a small piece of dough which I would fashion into my own, personal sized bun. Another favourite memory was when Mom would allow me to sniff my way through her stash of herbs and spices. She rarely used seasonings other than salt & pepper (as per Dad's preference), but she did keep a tin of spices for a few of her recipes. I still love the smells of the seasonings in my own kitchen and experimenting with new flavour combinations. Growing up in a large family cooking/baking were just something we always did. Saturdays would always be baking days because Sundays would always bring visitors for "Faspa". My first Christmas after moving away for college I received a small cookbook in my stocking and it was Chocolate Cake and Onions. That was my go to cookbook for a few years and even now I refer to it for a few "favourite" recipes. Have learned a lot of new recipes and techniques from watching cooking shows and reading cooking blogs. I did take a cooking class in middle school, but only because I had to. I don't remember much about it. I learned to bake by helping my mom, my aunts, and my grandma, who each had their specialties. My grandma's twieback were the BEST EVER. After I got married, I had to learn how to cook and I've never enjoyed that nearly as much as baking! 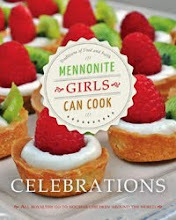 I've relied on good no-nonsense cookbooks like the Company's Coming series and my Mennonite Treasury which is marked up with the versions of the recipes that my grandma used. More recently, I've found some great food blogs (like yours!) to give me ideas and recipes. I learned how to cook when my mother was baking a pie, making our family dinner, or preparing noodles for a holiday meal. She always encouraged me to watch and answered many questions. I just thought cooking was fun! I got to help Dad cook dinner because mother worked full-time in an era when most women stayed at home. Later, in a middle school Home Ec class, I was baking the class project--corn muffins--with my team of classmates. We were pretty proud of our high-peaked yellow muffins until the teacher gave us a "C" grade complaining the muffin peaks were too high. I figured I still had some things to learn, so cookbooks helped me improve my kitchen skills. My favorite was the Better Homes and Garden cookbook, a gift which I still have today, 45 years later. Thanks to today's cooking blogs, tv cooking shows, and countless new cookbooks being published, I'm still learning new ways of updating old favorite recipes and improving the nutritional value of everyday meals. And it's still fun! I had some very rudimentary foods classes in junior high school but was interested in cooking from the time I was a small child. My mother did not enjoy cooking so she encouraged me to cook while I was in high school. (During those years I took sewing classes rather than foods because I was in a college prep track.) I went on to major in Home Economics in college and taught Foods classes for many years. I am now retired but still greatly enjoy cooking and trying new recipes and techniques to share with others. It all began with a class in high school called "Cooking Matters"! I have really learned to cook in the last five years since being married. My cooking style is a mix of Mexican, vegetarian, local/seasonal, and traditional. Although, I would be lying if I didn't say that baking is really my preference over cooking! Lots of trial and error and a family willing to try anything once. This is fabulous Lovella! I think this is a very creative way to teach cooking and it looks like nutrition is also part of the lessons! My mother was a wonderful cook but I really learned my earliest skills in high school Home Economics classes. I still use some of those old hand written recipes that were duplicated with the "ditto" machines! I agree that there will be some great foodies coming out of these classes. My mother never liked to cook, so it wasn't until Home Ec classes in 7th and 8th grade that I learned how wonderful cooking could be. Mrs. Vickery, our teacher, had high standards, but after we learned the rudiments, she allowed us to express our creativity. The Home Ec cooking classroom was divided into 6 small kitchen units Each "kitchen" team was allowed to plan a menu, make a shopping list and then walk across town to the grocery and shop for the ingredients. I remember most vividly the time my "kitchen" made Crepes Suzettes. We were the envy of the class for making something so exotic, at least to us 13-year-olds! Now I cook for family and grandchildren and love to can what we grow in our garden. What an adventure Mrs. Vickery set me on and I wish often I could have thanked her. I was fortunate that my mom and both grandmas taught me how to cook. Not only that, they instilled in me a love for sharing delicious homemade food at family meals and social gatherings. Last year I was also invited into a high school foods lab where I watched the students craft their perfect cafeteria meals. I agree that their creativity and enthusiasm was encouraging to see! If food was happening, I was there! Mom, grandmothers and aunts all had me underfoot for as far back as I can remember. When I was 12 I talked my mom into letting me join a cookbook club and my love of exploring new foods began. I am still learning, 50 years later! I learned the basics of warm family favorites from my mother, but I learned new and interesting twists on blogs like this and shows on Food Network. It's all good! My sister and I had to share chores around the house. She hated anything in the kitchen and I disliked housework. I ended up helping my dad make all meals. He was the better cook of my parents so made most meals. He taught me how to use a knife properly at a very young age and was making meals without much of his help by age 10. My maternal grandmother was also a wonderful cook and she believed in letting the grandkids help no matter how old they were. When we were very young, we were given the mixing spoon or a butter knife instead of a regular knife to help. It was a great way to bond with both my father and my grandmother over cooking. My grandmother has since passed on but when making certain recipes, I think back to my days of helping her and it always brings a smile to my face. It wasn't just about the cooking for us, it was a great way to spend time together and bond over a love of cooking and I have many wonderful memories that all seem to be over helping in the kitchen. I was taught to work at an early age.. A mere 13 when I held a nights position in a local restaurant where I was the night cook. My boss believed in me, and I excelled, only learning by hands on, and entirely on my own! I LOVE to cook.. And am known in our community for that Love. People often call for recipes and tips and advice. I am now a homeschooling mom of 3 children (19,11,8), and they now are learning that same passion of cooking, via hands on! I enjoy having company over and blessing others with cooking and baking!!! I learned baking and basic cooking from my mother who was a Home-Ec teacher. She was especially fond of baking and treats and taught her students to decorate cookies and cakes. By junior high I could decorate cookies for holidays like Christmas or Easter, and make icing roses to decorate cakes. She had boxes of recipe clippings and give-away pamphlets. I learned a lot from them, also, and loved to experiment with the recipes in them. I did take Jr high home-economics class, but learned more from my Mom and Grandmother, then from experimenting. I'm glad some kids are still taking foods classes and learning how to cook and about nutrition. It is great that they would be learning how to use the ingredients available wisely. I am a retired Home Economics teacher and spent most of my years teaching Foods classes to students from grade 8 to grade 12 and I loved being in my classroom even though there were many frustrating moments with difficult students and problems with budgets etc. Working within a one hour time frame presented a challenge. 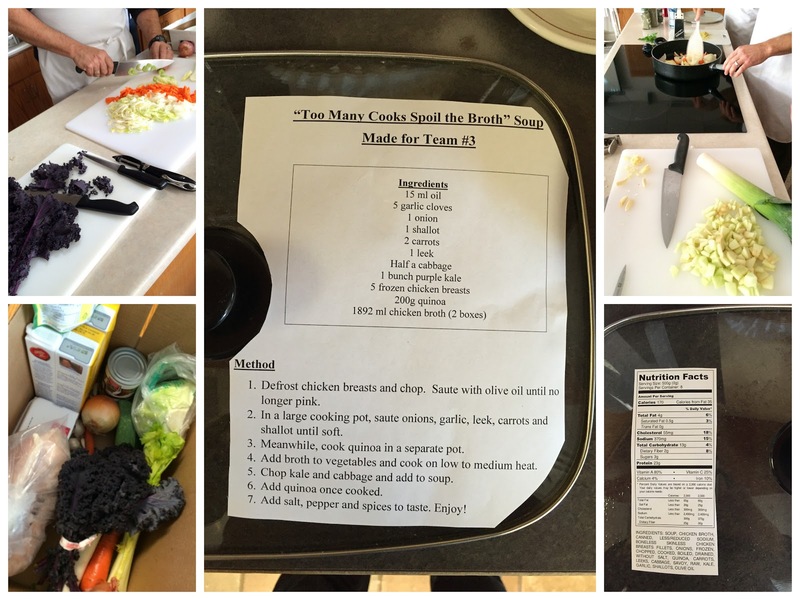 Loved everything about your post but mostly, am happy to see the way they were approaching the preparation of the soup, looking at the nutritional info and being creative with what they were given to work with. That kind of teaching should really encourage those students who like to be creative and think outside the box as well as give them the basics of what they need to know to cook safely and be healthy and serve a tasty product that is pleasing to look at. So nice to hear about Foods and Nutrition being given some importance in the curriculum as Home Ec teachers in the past always had to fight for their subject. A healthy mind that is able to absorb and learn in all curriculum areas begins with a healthy body that is well fed with the proper nutrients. I fought those darn vending machines with 'junk' food fiercely and never had success because of the income that the school earned by selling Coke or Pepsi and chocolate bars. You brought a smile to my face and made me very happy with your post. Thank you! It was fun to read and took me back to my teaching days. 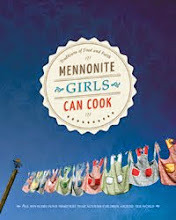 I learned to cook from my grandmother and mom who were both good Mennonite cooks. Able to keep the labourers on their berry farm well fed. My mom would talk of driving the tractor at 10 yrs old to deliver the food to the men in the fields. The Mennonite Treasury was always at hand-well worn, stained and filled with notes in the margins. My grandmother taught me how to properly shape buns and I remember eating strawberries til I burst! preparing them for jam. Ah! We kids loved to visit grandma & grandpa just for the buns and jam. We lived in the cold climes of Prince George and the annual trip to Chilliwack was likened to entering the land of milk and honey! My favorite food memory of my mother is her rote gruze ( pls excuse if spelling is incorrect!) It was made from the extensive raspberry bushes we had in our garden. What a refreshing summer treat with vanilla flavoured milk. We grew and preserved enough to keep a family of 6 well fed through long. winters. I learned so much about teamwork as we put in long hours working together and then enjoying the green beans & carrots et al.. from a seemingly long ago summer in January. What a great way to teach cooking!!! I learned how to cook after I got married...my mom was a good cook but didn't share the kitchen well. Thanks to Betty Crocker, I didn't kill my husband those first few years!!! I'll never forget following the directions for making spare ribs in the oven...it was hard to tell the difference between the bone and the meat...bless my husband, he ate half of them!!! I learned to cook in the kitchen. Mom didn't always share the kitchen well because of being in a hurry, but I learned a lot by watching her. Now I work as an EA in a rural school in Saskatchewan and often get to help out in Home Ec. class. It's so satisfying seeing the kids learn and grow in their food making journey. Learn to cook by my Mom side, she cooked the simple home cooking meals. Sad to say they don't teach Home ec. anymore, when I was younger it was required to take in 7th & 8th.... But not no more, they even have taken shop away for the guys in high school here where I leave now. I wonder how all these young kids are going to learn to take care of themselves, most don't learn how to cook from their mothers anymore, most of these young mom's don't even know how to cook or they just don't want to (in fact when my brother got married his wife said she will not cook or clean - big surprise to him- he does it all now). My kids go off to college and they know how to cook but a lot of there roomies do not know how to do anything (cooking - cleaning). My son at college will make cheesecake, what guy at college does that? I have always had my kids by my side, working right along with me (no I'm not a great cook, but they think I am). They learn the basic and now have fun exploring on their own, thanks to the great internet world of food bloggers. My food will never taste as good as my Mom's.